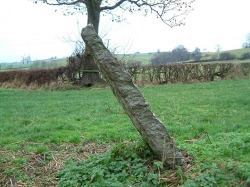 This suggested standing stone lies 1/4 of a mile away from the impressive Norman church at Bradbourne. Situated close to a pond the stone is a lone survivor of 3 stones that once stood in this location, the other 2 stones are said to have been removed to help build the bridge you crossover between the church and the pond. 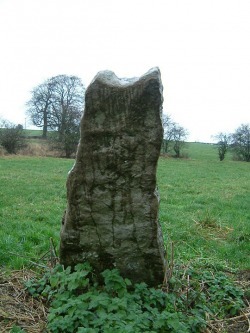 Visible within the stones fabric are fossilised crinoids or Derbyshire Screws as they are known across the limestone region. Parking is available directly outside the church. Head through the gates, worth a look and stood by the path is a repaired Anglo-Saxon cross as is also the Norman arched doorway in the tower, visible as you approach church. To get to the standing stone follow the path round to the right of the church and look for the gate round the back of the church....now it's just a case of following the path down to the pond. The stone is visible over the otherside of the pond as you approach it; follow the path around the pond toi gain access to the field.